We’d love your help. Let us know what’s wrong with this preview of The New Dewtas by Suraj Kothiyal. About the Book : Neer, the head priest of the Himalayas, is troubled by the horrifying visions in his dream. On Ganga Maiyya's behest, he embarks on a journey to the doomed island of Bali. The island, plagued with cyclic torments of Sekala and Neskala and suffering from constant rainfall, faces an imminent danger of drowning in sea. However, Neer's power was no match for t About the Book : Neer, the head priest of the Himalayas, is troubled by the horrifying visions in his dream. On Ganga Maiyya's behest, he embarks on a journey to the doomed island of Bali. The island, plagued with cyclic torments of Sekala and Neskala and suffering from constant rainfall, faces an imminent danger of drowning in sea. However, Neer's power was no match for the strong evil forces that kidnapped the king and the queen, activating the volcano of Mt Agung. With the neighboring king of Java on his toes to attack and conquer the struggling island of Bali, will the gritty prince Erlangga, assisted by Neer, be able to save his kingdom? Read to find out how people turn towards the new dewtas introduced by Neer as the end becomes evident and how Eka-dasa-Rudra helps in arousing the most furious energy of this world, Rudra. About the Author : The author, Suraj Kothiyal, hails from the beautiful city of Dehradun with his family roots belonging to the Himalayan region. His parents are teacher by profession, brother works in a software firm and wife is a dance teacher. A mechanical engineer and an MBA in marketing, Suraj, had five years of corporate experience before he started his own entrepreneurial journey. Today Suraj’s construction firm develops beautiful living spaces for its customers in Dehradun. Apart from marketing and construction, Suraj has keen interest in writing. He has been writing since childhood. Initially the hobby started out as writing poems in Hindi for school magazine. His love of poetry continues, and his collection of Hindi poems can be seen on his personal blog that goes by “poems.surajkothiyal.com”. To ask other readers questions about The New Dewtas , please sign up. 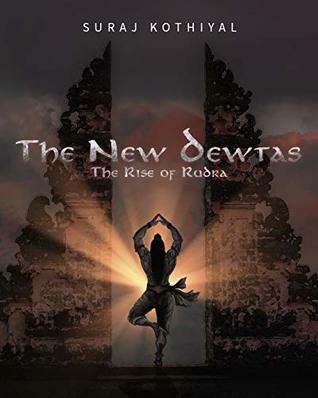 The New Dewtas: The Rise of Rudra by Suraj Kothiyal is an amazing story of Neer. The head priest of the Himalayas who goes to Bali to save the king and the kingdom.Will save the kingdom? what happens next is a mystery. The plot of the story is interesting, full of twists and turns. Divided into 28 chapters, each chapter unfolds the mystery keeping the reader hooked throughout. The narration of the story is crisp and engaging. One can relate to the story well. The book gains readers interest, though The New Dewtas: The Rise of Rudra by Suraj Kothiyal is an amazing story of Neer. The book gains readers interest, though At places the book gets a bit tedious. The Pace of the story is medium with a smooth flow. Themes like Fantasy, fiction, mystery are used by the author to make the story more appealing. There are drama, dialogue and some beautiful illustrations that make this book more precious. I liked how the events were sequenced by the author. The way neer saved the kingdom, the way the King reacted, everything was aptly written. It’s a mythological fiction with a simple language. The writing style of the author is gripping and up to the point. The character development and the backdrop used by the author is commendable. Each character had a vital role to play. I loved Neer’s character the most. I liked His personality. The backdrop of Bali used by the author is excellent. I love the mythology genre. And I am waiting to read more from the author. The cover and Trailer grabs my attention so I couldn’t resist picking up this book. The protagonist of the story is Neer. The story opens up with the scene of a ship that is stuck in turbulent water. So that is a really nice opening scenes. And I loved the way the book has been presented. That reminded me of my childhood, because in my childhood, I used to read such mythological story with dew relevant pictures drawn in i I love the mythology genre. And I am waiting to read more from the author. The cover and Trailer grabs my attention so I couldn’t resist picking up this book. The protagonist of the story is Neer. The story opens up with the scene of a ship that is stuck in turbulent water. So that is a really nice opening scenes. And I loved the way the book has been presented. That reminded me of my childhood, because in my childhood, I used to read such mythological story with dew relevant pictures drawn in it. ➡️ I definitely liked and fell in love with this book from the moment I saw video trailer and read blurb. It’s quite fascinating. ➡️ Unique and different plot. ➡️ I loved the inclusion of pictures. They are wonderful and that makes book more attractive. ➡️ Good use of vocabulary and language. ➡️ Story grabs your attention from beginning to end. ➡️ During whole time, you can imagine whole plot as if you are watching a movie. So definitely well narrated. ➡️ Unpredictable storyline with lots of twists and turns.